Invariably when discussing tiny houses, there are some subjects that garner more interest than others and it seems that one of the really popular discussion points is toilets. Every house needs one or at least proximity to one. Composting seems to be by far the most popular option for a variety of reasons and I'm sure quite viable. Frankly there aren't too many options available for a house on wheels. A standard flush system is pretty much out of the question for most applications. I decided (for now) to go a different route. Since power is utility provided and not an issue at my property, it allowed me the additional option of an Incinolet. 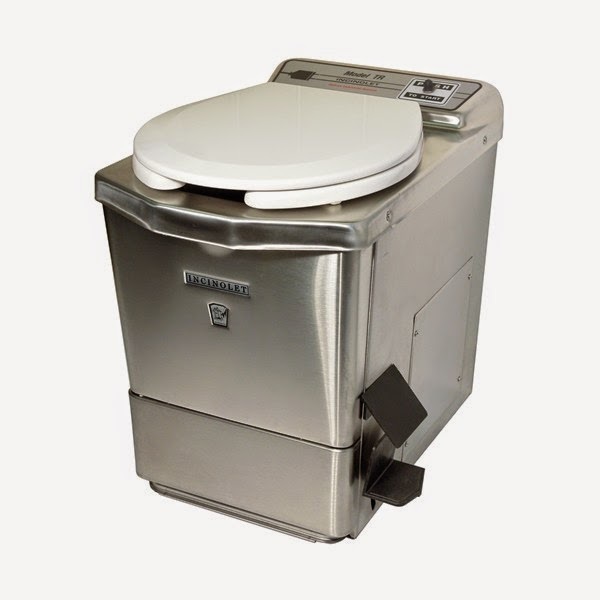 For those unfamiliar, an Incinolet is a clever toilet that requires no plumbing…so in that way much like composting. That's where the similarities end though. I'll provide my thoughts and review further down but, Incinolet stands for 'incinerating toilet' and is manufactured by a small company in Texas. I believe there might be one or two other manufacturers internationally but, it's a small pool of options if going this route. I acquired mine off of Ebay. It had been installed in a camper renovation which was never completed and therefore sold off before ever being used. That got me a much better price than the $1800 list price. Yes, it's pricey. There are four models for different implementations. The way it works is you put in a paper cone of sorts into the 'bowl' which is all stainless steel. Then you heed the call of nature. There are no restrictions on type of toilet paper. Once you're all done with that, you 'flush'. That is a two part process. 1) There is a foot pedal that opens the 'jaws of hell' as I like to call them and gravity proceeds to drop the aforementioned paper cone into the combustion chamber in the base of the toilet. When you release the foot pedal the jaws close again and you are left with the stainless steel bowl. No mess. So here's the part you're likely interested in…my review. Since the interior of my Linden is not complete, I currently have the toilet set up in a shed on the property. So far it's been great and I don't regret the purchase. If you watched the video above you'll note that I have it vented to the outside but through a very short pipe. On the final install I will likely run an easily removable vent pipe up the side of the house. The reason for this is that the combustion smell is umm…interesting. I've read some accounts of people being really put off by it and others had indicated that it wasn't a big deal. I'm more in the latter category. It does smell a bit strange but that last only for a few minutes. With proper venting, I don't foresee having any issue with that on the final install. Unit is also built really well and is ultimately not that complicated a device. I was surprised how many cons I came up with above. Final verdict though is that it's the right choice for what I was looking for but, I get that it might not be a good option for everyone. UPDATE (1/13/16): This page in my blog happens to be the most popular and most searched! I can say that I have now been using the Incinolet for over a year and it is still functioning fine. There are no issues with it; maintenance is really minimal and the quality/longevity seem to be there. If you are on the fence about this, I hope that this 'long term review' helps you with your decision, since the acquisition cost is on the high side.